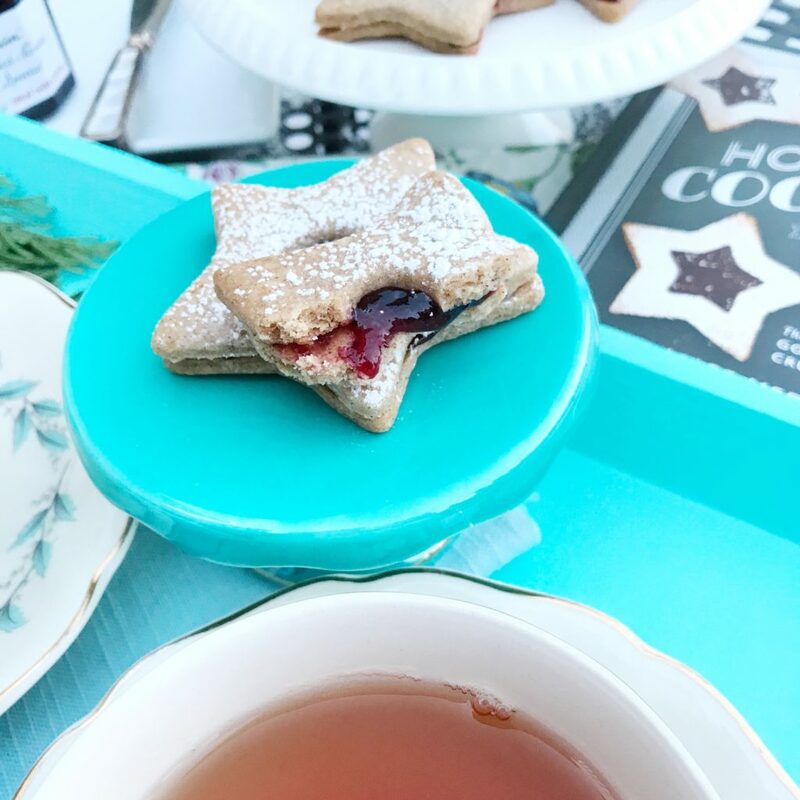 When I received Holiday Cookies*, part of The Artisanal Kitchen series, I was very excited because it’s a compact hardback book packed with lots of hand-picked recipes. I don’t often spend the time reading the first few pages of a cookbook because I just want to go to the recipes, but this time I did. The User Guide in the beginning explained a lot things that I hadn’t understood about baking before. *Recipe excerpted from The Artisanal Kitchen: Holiday Cookies by Alice Medrich (Artisan Books). Copyright © 2017. Photographs of the cookies on the book cover and inside the book are by Deborah Jones & Lauren Volo. The tips and FAQs are intended to help you understand why some recipes may not turn out as you expect. For example, Alice explains why too much flour can harden cookies (seems obvious, but how you measure flour may be the reason and so can over-mixing), why chilling is important (helps the flavors deepen), and why you need to rotate pans (for even baking as the temperature in the back and front of the oven may vary). Anytime I learn a few tips from a pro, I’m happy. And, I’m always thrilled when I can add a new recipe to my repertoire! 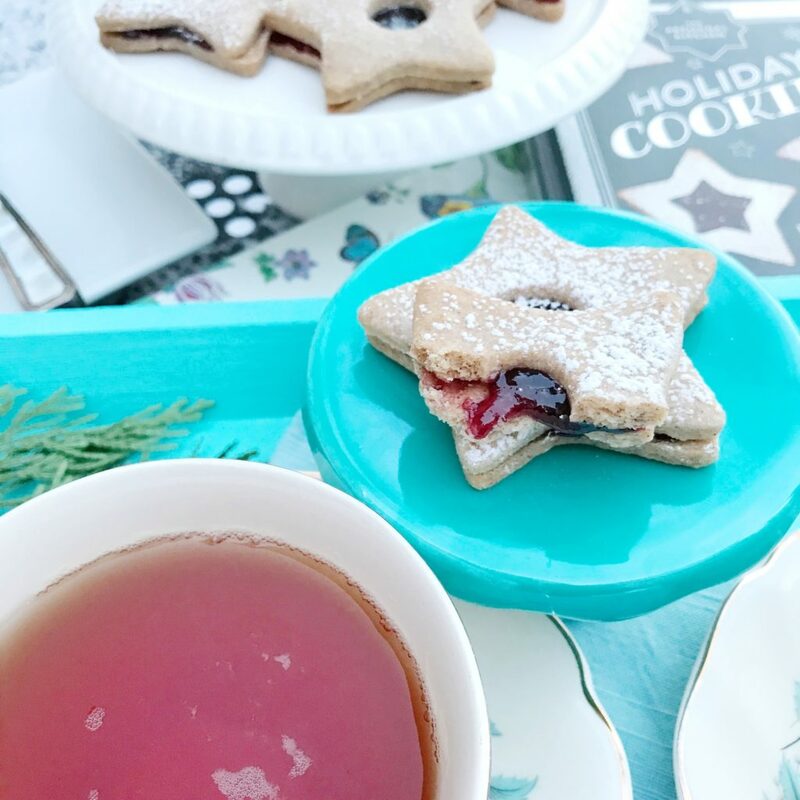 Although this post is on Linzer Cookies, I’m looking forward to trying out a few more recipes from Holiday Cookies, including Bittersweet Decadence Cookies and My Ginger Cookies. Look for future posts on these recipes where I’ll be sharing the special tips for making perfect cookies from the author. 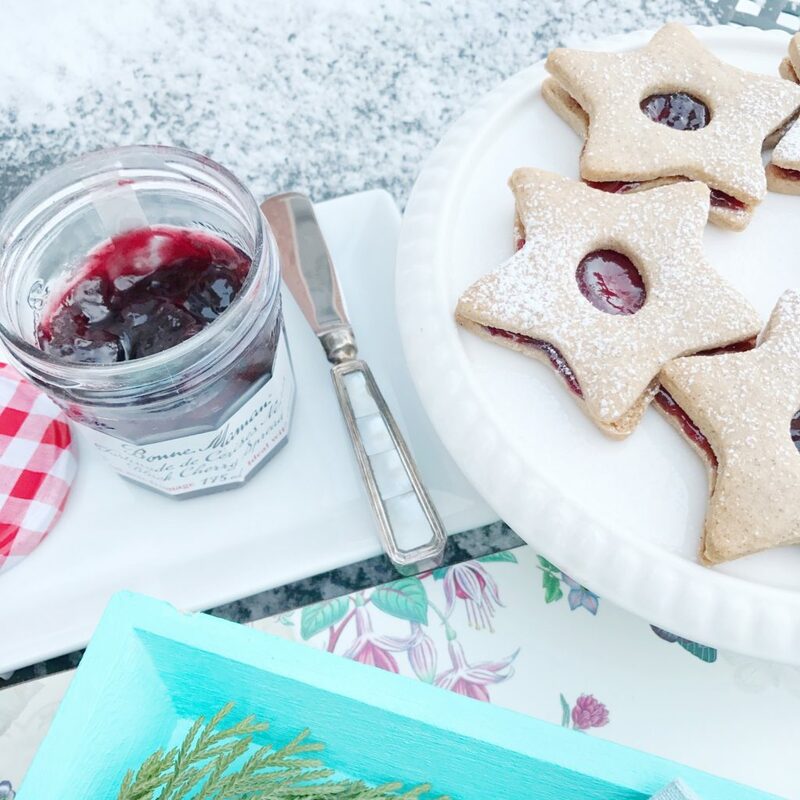 These Linzer Cookies are made by grinding almonds in a food processor along with all the other dry ingredient, adding the butter, almond extract, and citrus zests at the end. They’re so good and so flavorful. You can taste the almonds, lemon, and lime zests in each bite, and it’s these flavors that make the cookies so delicious. Of course, I chilled the dough as required and avoided too much flour when rolling out the cookies. 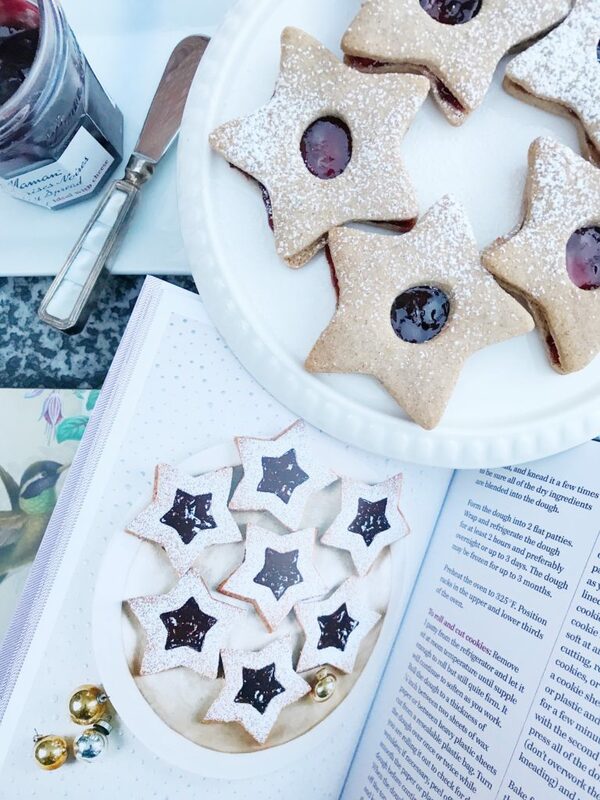 I filled the cookies with Black Cherry Spread from Bonne Maman, a French company famous for its natural, old-world spreads and traditional packaging. The contrast of the dark cherry flavor with the almond and citrus zests was perfect. Combine the flour, nuts, granulated sugar, salt, cinnamon, and cloves in a food processor. Pulse until the nuts are finely ground. Add the butter (cut into several pieces if firm). Pulse until the mixture looks damp and crumbly. Add the almond extract and the lemon and orange zests or extracts and pulse until the mixture begins to clump up around the blade. Remove the dough, press it into a ball ,and knead it a few times to be sure all of the dry ingredients are blended into the dough. Form the dough into 2 flat patties. Wrap and refrigerate the dough for at least 2 hours and preferably overnight or up to 3 days. The dough may be frozen for up to 3 months. Preheat the oven to 325 degrees F. Position racks in the upper and lower thirds of the oven. To roll and cut cookies: Remove 1 patty from the refrigerator and let it sit at room temperature until supple enough to roll but still quite firm. It will continue to soften as you work. Roll the dough to a thickness of 1/8 inch between two sheets of wax paper or between heavy plastic sheets cut from a resealable plastic bag. Turn the dough over once or twice while you are rolling it out to check for deep wrinkles; if necessary, peel off and smooth the paper or plastic over the dough before continuing to roll it. When the dough is thin enough, peel off the top sheet of paper or plastic and keep it in front of you. Invert the dough onto that sheet and peel off the second sheet. Cut as many large shapes as possible. Dip the edges of the cookie cutters in flour as necessary to prevent sticking. Cut a smaller shape from the center of half of the large shapes. Use the point of a paring knife to lift and remove scraps as you transfer the cookeis to the lined or ungreased pans. Place large cookies at least 1 1/2 inches apart on the cookies sheets. 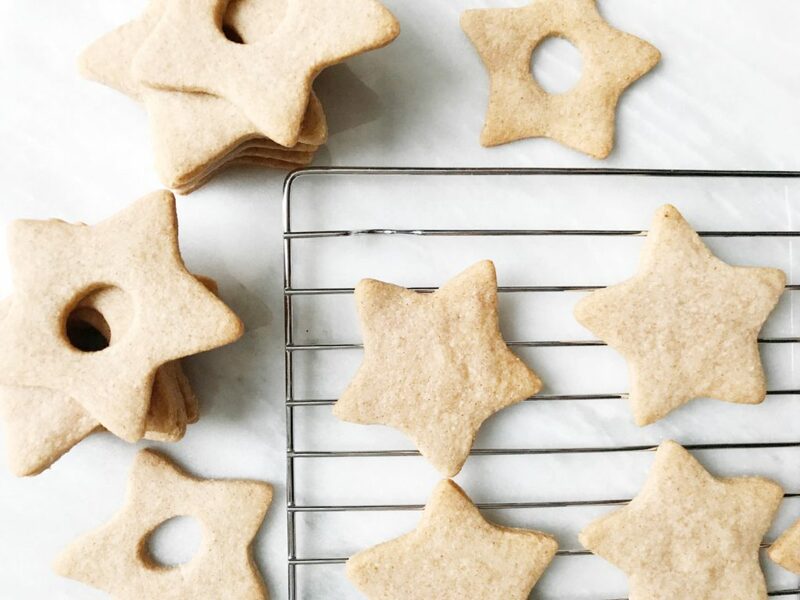 If the dough gets too soft at any time – while you’re rolling, cutting, removing scraps between cookies, or transferring cookies – slide a cookie sheet underneath the paper or plastic and refrigerate the dough for a few minutes, until firm. Repeat with the second patty of dough. Gently press all of the dough scraps together (don’t overwork them with too much kneading) and reroll. Let the cookies firm up on the pan for 1 to 2 minutes. For lined pans, set the pans or just the liners on racks to cool; for unlined pans, use a metal spatula to transfer the cookies to racks. Cool the cookies completely before stacking or storing. The cookies are delicious fresh but even better the next day. They may be kept in an airtight container for a month or more. 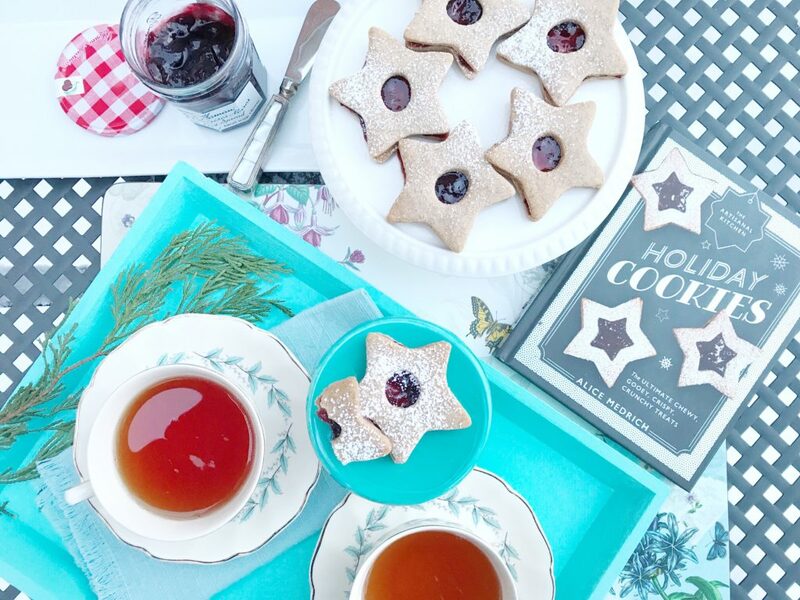 To assemble, shortly before serving, spread each solid cookie with a thin layer of preserves. Sift powdered sugar over the cookies with cutouts. 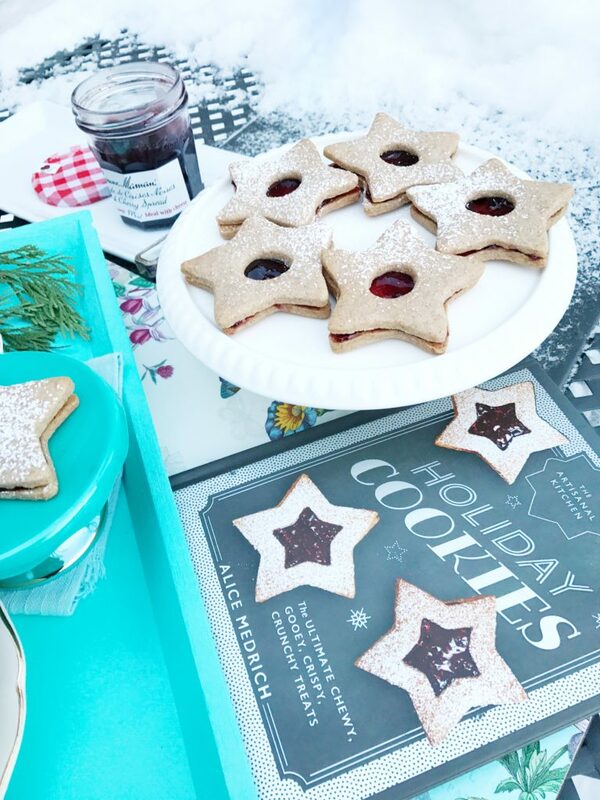 Place a sugared cutout cookie on top of each preserve-covered cookie. Leftover cookies can be stored in an airtight container, but the moisture from the preserves will soften them. I didn’t have almonds at home, but I had almond flour. I used 1 cup of loosely packed almond flour. I reduced the flour to 1 3/4 cups. I omitted the cloves. Wax paper is my preferred method for rolling cookies and I place one hand under each shape under the wax paper, while peeling it off with the other. And, by far, the best tip is to assemble cookies only when you plan on serving them. I used to assemble my sablé cookies and freeze them in the past, but they would be so soggy and I would be so disappointed. One call to my mom is all it took to figure out that freezing the cookies unassembled is key! 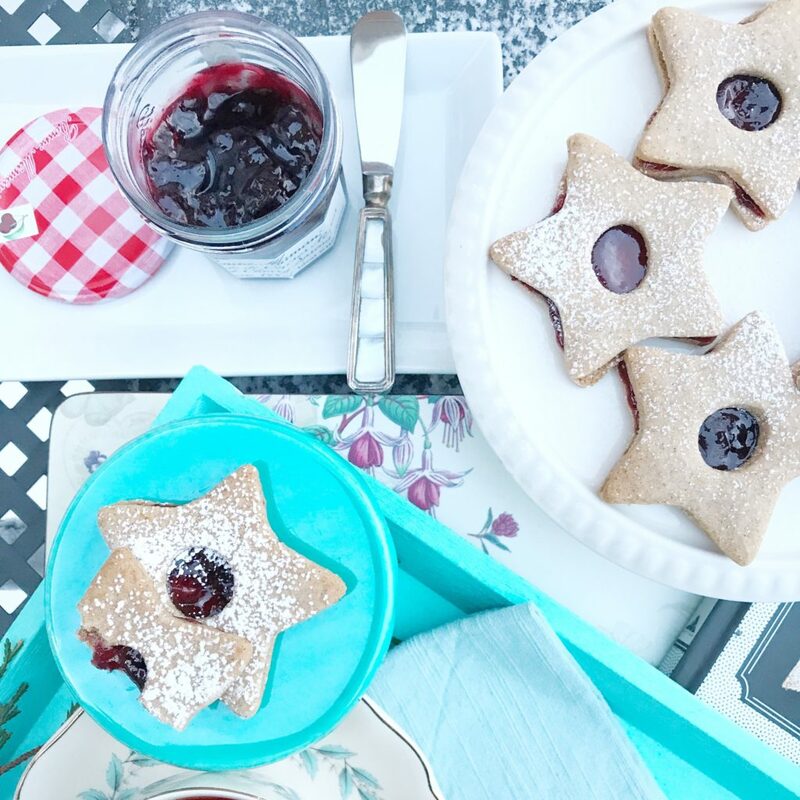 Have you ever made Linzer cookies? What tips do you have? And, if you bake a lot, have you checked out my post on packaging holiday cookies, here? Happy New Year and all the best for 2018! Make sure you try some new recipes, ideas, and ways of doing things because it’s the best way to add more recipes to your repertoire. I received Holiday Cookies* and the Black Cherry Spread compliments of Thomas Allen Ltd Canada and Bonne Maman, respectively. All opinions are my own. Next > Chicken-Ginger Noodle Soup – Perfect For This Freezing Weather! I have tasted these cookies and I can vouch for their deliciousness! Glad you like them, Patsy! This is awesome! I even was wondering about the almond meal before you mentioned it! Great minds?! Now I’m curious as to whether this can be converted completely to gluten free. We go gluten free on week/work nights. So glad you enjoyed this post! Good question about making these gluten-free. I did a bit of reading and it seems that Bob’s Red Mill Gluten-Free All Purpose Baking Flour is made with a combination of flours, so it might be a good place to start. You could try increasing the amount of almond flour by a quarter cup (to 1 1/4) and starting with 1 3/4 cup of gluten free flour. (I used an almond floud/meal that wasn’t too fine). When you’ve mixed everything, check the consistency of the dough – it should be the same as for any other sugar or shortbread cookie. If you need to add flour, do that. Let me know if you try making these. Happy New Year and all the best for 2018!